Port-La Nouvelle is France’s third largest commercial port on the Mediterranean. It is ranked number one for grain exports and number two for hydrocarbon imports. Owned by the Occitanie / Pyrénées-Méditerranée Regional Government Council since 2007, the port is managed by the Chamber of Commerce of Aude. Known for its reliability and supported by both quality infrastructure and labour, the Port managed the import and export of all kind of goods including petroleum products, liquefied gas, liquids, cereals, varied agricultural products, dry bulk, general cargoes and heavy lifts. The Chamber of Commerce has managed the port since 1948 and is continually investing to support the development of logistics and industrial activities. The port operation is certified ISO 9001. The equipment and port facilities are constantly updated to ensure greater operational efficiency. Recent updates include new grabs for handling dry bulk commodities, dust-free hoppers, mobile cranes, regular cleaning of working areas and quay side and improved waste management. Current traffic represents 2 million tons per year and 350 ship visits. The global port activity generates 1,600 direct and indirect jobs. The primary expansion phase of Port-La Nouvelle will see the creation of a new outer harbour to accommodate larger ocean-going- vessels, those up to and including 225 m length x 36 m beam x 14.50 m draft (about 80,000 deadweight tons). The port facilities will be extended, thereby adapting the port to meet its ever growing targets and activities. It will include new terminals (70 ha total) for the efficient handling of liquids, grain, dry bulk and breakbulk cargoes and will include an industrial area of 80 hectares. Further planned expansion of the existing railway facility will ensure that Port-La Nouvelle will be efficiently connected to Northern Europe. 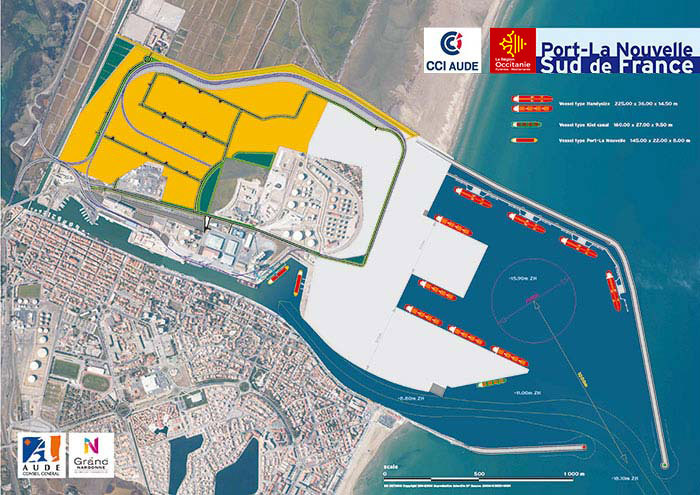 The port expansion will be 70 % financed by the Occitanie (Pyrénées Méiterranée) Regional Council, with 15 % provided by the General Council of the department of Aude and 15 % from the Intercommunity of the Grand Narbonne for 15 %. The Occitanie / Pyrénées-Méditerranée owns 2 commercial sea ports (Sète and Port-La Nouvelle). 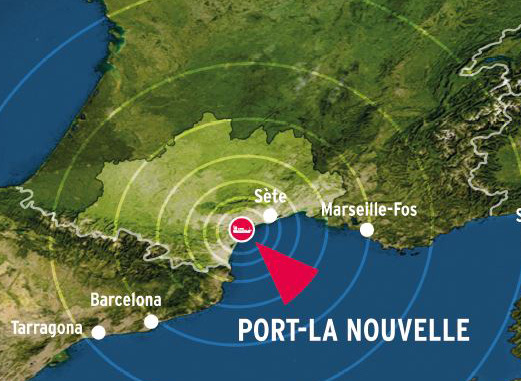 These two regional ports are marketed under the banner “Ports Sud de France”. Across the region, there is also the maritime port of Port-Vendres which belongs to the General Council of the Pyrénées Orientales and the river port of Laudun-l’Ardoise owned by Voies Navigables de France (VNF). The Regional Authorities have wide powers with regards to transport. In addition to the commercial ports, the Region manages 10 airports, regional express trains (TER) and non-urban road passenger transport. The Region also operates fishing ports and marinas. Commercial ports are structural elements of Regional territories and are therefore extremely attractive locations for economic development. With a large part of of its annual budget invested in regional transport infrastructures (ports, airports, railways, public transportation), the Occitanie (Pyrénées Méditerranée) Region shows an ambitious and consistent investment policy that safeguards its future.